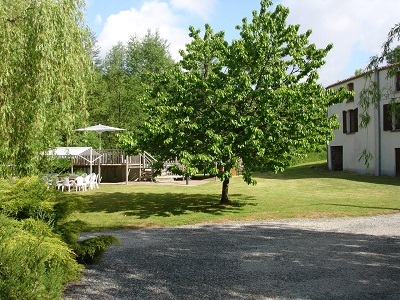 The Mill is a converted Water Mill set in several acres of private land, located in the Vendée region of Western France. It has seven bedrooms and can accommodate 16-18 people. 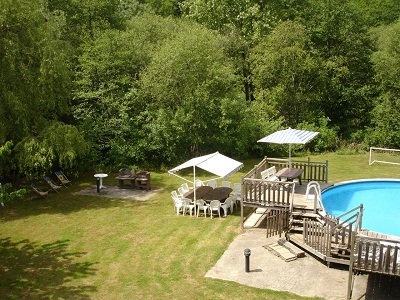 The Mill has a large private heated swimming pool, large private gardens, and a unique character. All quilts, pillows & covers provided for up to 16 people. 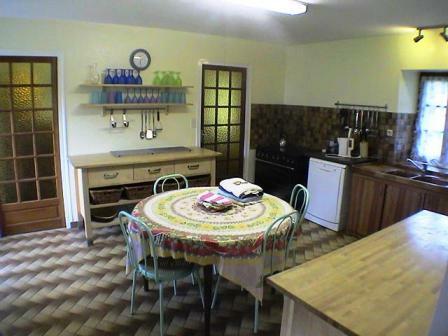 large fully equipped kitchen (cooker, combined microwave/grill, 2 x large fridge/freezers, dishwasher, automatic washing machine etc). Bathroom (bath & shower), shower room (shower & WC) newly built spring 2004, separate WC. 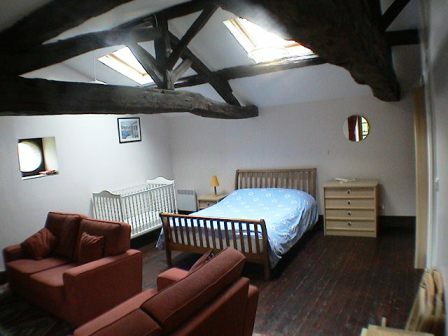 Electric wall heaters in each room provide heating in addition to the log burning stove if required. 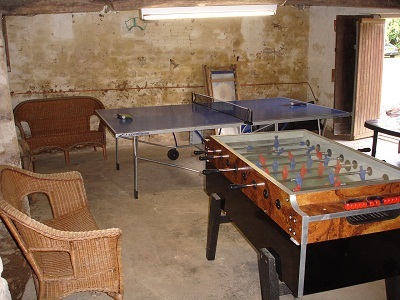 Table tennis room with permanent table. Video & DVD players with large widescreen TV, UK Satelite system with 2nd TV (for non encrypted UK TV and radio channels e.g. BBC1, BBC2, ITV, Channel 4, Channel 5, Sky News, Channel5, Cartoon Channel, Radio 5 etc). Inclusive of all Bills. All bedding will be provided. The week runs Friday to Friday, 2:30pm arrival, depart by 09:30am. This does not apply low season when dates can be negotiated. 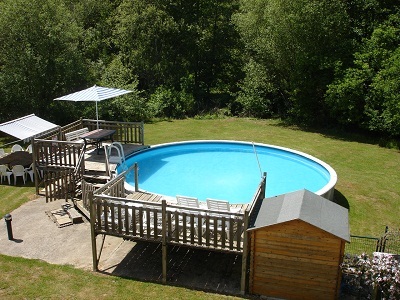 A £250 per week per dwelling cancellation deposit is payable on booking. Full payment is due twelve weeks before departure. Deposit of £100 per week per dwelling is also payable with balance, which is returned on confirmation that place was left clean and tidy as per instructions. The Wheelhouse is located on the outskirts of the village of L'Hermenault in the South Vendee. A tranquil location, yet conveniently situated to various amenities. The village is less than 1 kilometre away, and has a lovely boulangerie, mini supemarket, tobac, post office, banks, English speaking Doctor etc. 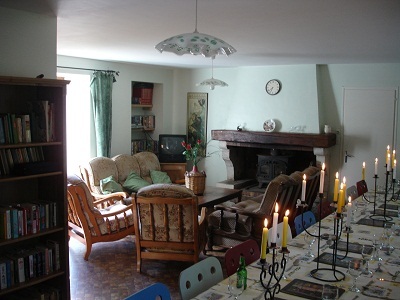 The nearest town is the renaissance town of Fontenay le Comte which has many restaurants, cafes, shops, supermarkets etc. This is 15 minute drive away. La Rochelle is France's 2nd largest boat building port and the historic Vieux Port remains largely unchanged. A daily fish market can be found in the old town until 12:00 midday. The port is very attractive and waterside cafés and restaurants offer a relaxing break. The seafood platters are their speciality and are excellent especially for large groups, where a single huge dish of shellfish is produced. Futuroscope is situated near Poitiers, it combines latest cinematic developments with the entertainment and fun of a theme park. there are a dozen or so main attractions comprising some of the largest cinema screens in the world (seven storeys high), 3-d special effects, flight simulators, cinema seats on hydraulic pedestals, all around cinema with picture that extends underneath you, 360degree cinema screens, huge curved screens etc. Mervent is only a short bike ride from L'Hermenault, it has a dam and a large reservoir. The area has been developed with tourism in mind. There are large wooded areas ideal for walking and particularly mountain biking. There are places where pedalos and wind surfers can be hired, and wind surfing lessons are offered at reasonable rates. There are also restaurants, a small zoo and a very extensive fun park known as 'Pierre Brune', which has dozens of rides from castles, crazy bikes, and slides to hamster wheels and see-saws. This is good value at approximately £3. Venise Vert is the canal system the Vendée is famous for. There are numerous places (Maillezais is one of the best, 20 min drive from L'Hermenault) where small rowing boats can be hired (with or without guides). Maps are provided and you can navigate round canal systems to set routes. Puy de Fou is well worth a visit, by day there is a theme park which includes mediaeval jousting, villages with traditional crafts and actors dressed in the period of the day. The highlight is a twice daily display of falconry. The display is held in an amphitheatre with hawks, falcons and eagles swooping over the crowd and collecting food from the falconers who are dressed in traditional costume. This includes every bird of prey you have ever imagined including some enormous vultures. Great fun and highly professional ! By night during the summer Puy de Fou is renowned for holding France's foremost Son et Lumière spectacle. This is a re-enactment of the dress history in full costume by night and includes battle scenes, village life and laser special effects set around a castle and lake. It includes a cast of hundreds of locals and is carried out on Friday and Saturday nights. Every show is sold out in the height of summer, but tickets can be booked in advance. There is also an English translation available on cassette. If you wish to go to the evening event and get the translation this can be booked in advance by credit card. Île de Ré is a quiet island off La Rochelle, a new road bridge makes it accessible by car. It is picturesque and has numerous beaches, cafés, towns and parks. The cost for the toll bridge is approximately £10 but is free if you cycle or walk out to the island. There is also a very good value golf course on the island. Cognac is approximately 1½ hours drive south and well worth a visit for the connoisseur. In the centre of the town the best tour is that of the Otard distilleries, where cognac has been made for hundreds of years. A sample session follows the tour, but drivers beware, new laws on drink driving are more strict than UK. Saumur is more for the wine buff, it is similar distance north and this town on the Loire also offers numerous caves (cellars) along with various historic buildings. St Emilion is ½ hour drive south of Cognac, this historic wine producing region is for the red wine enthusiasts and boasts excellent tours of vineyards and historic sites. Beaches in the Vendée are excellent, clean and sandy. The nearest are approximately 40km away and take a little under an hour to reach. There are three resorts next to each other on the coast, la Tranche-sur-Mer, l'Aiguillon-sur-Mer, and la Faute-sur-Mer . All are excellent for families, for the larger more touristy type of resort les Sables-d'Olonne offers full facilities expected of a more commercialised resort. This very popular resort is 70km away and takes approximately 1½ to reach. 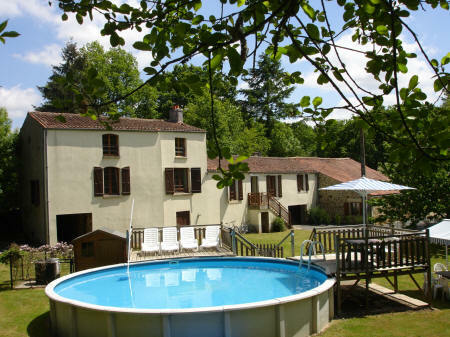 Vouvant is a quiet historic town with a church overlooking a valley and river. There is a very good crêperie and pedalos can be hired out by the hour. This is ideal for the kids as it is only 15 minutes away. All airports served by discounted airlines i.e. Ryanair, Easyjet and Flybe.